Living Life Fully Shouldn't Be A Shock! -Start warming milk in pot, whisk everything together in the pot. Don’t over cook. 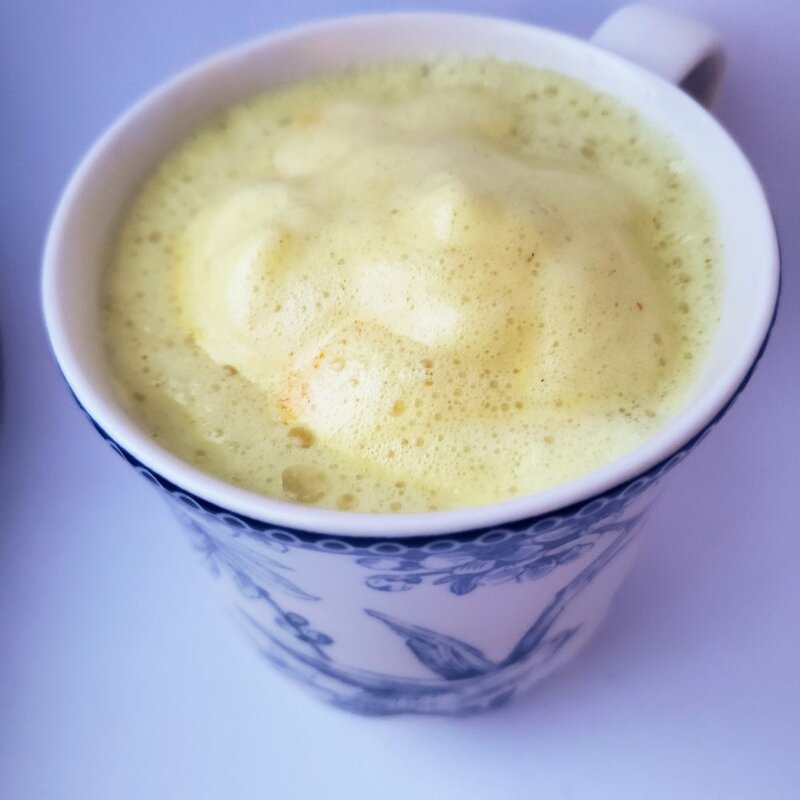 Once it reaches a nice hot temperature (all the ingredients have blended together and it is a nice even yellow color) Use an electric hand held milk frother to make a nice layer of foam. Feel free to top with a few sprinkles of cinnamon on top and enjoy! Flash back to the time I used to make our sunflower seed butter from scratch! I roasted the seeds in the oven for about 10 minutes, stirring it about every 2 minutes. I used both extra virgin olive oil and organic coconut oil for the balance of fats for our son. After about 45 minutes, I ended up with creamy organic sunflower butter (there were minor pieces in the finally product but it is barely noticeable). I did not add anything to it! I DID NOT add salt, or sweetener as other recipes advise because the taste was great without! 1 cup does not yield a lot, about 4 oz. Next time I will do 3 cups at a time to fill up the jar. Good luck and happy healthy living!! I usually add 1 banana, half an avocado, half a lemon (squeezed juice), a tablespoon of grated ginger, 1 tablespoon of chia seed, a handful of spinach, 1 tablespoon of coconut oil, 1 cup of almond milk, half a cup of coconut water, a bowl full of fruits (varies), 1 tablespoon of honey, 3 tablespoons of hemp hearts, and 1 tablespoon of spirulina. I blend using our vitamix! In honor of Autism Awareness Day I thought it would be fit to acknowledge the significance of raising awareness. About 1 in 68 or 1.5% of children were identified with ASD based on tracking in 11 communities across the United States in 2012. According to previous reports, the percentage of children identified with ASD increased between 2002 and 2010. The new report shows no change between 2010 and 2012 in the percentage of children identified with ASD. "Most children identified with ASD had concerns about their development noted in their health and/or special education records by age 3 years. Yet, less than half of children with ASD received a comprehensive developmental evaluation by this same age. A lag between first concern and first comprehensive developmental evaluation may affect when children are being diagnosed and connected to the services they need." "Black and Hispanic children are less likely to be identified with ASD. Those that are identified with ASD receive comprehensive developmental evaluations later than white children who are identified with ASD." Your kidneys are critical for your well being. The primary role and function of the kidneys is to process an average of 200 quarts of blood to extract two quarts of bodily waste and extra water on a daily basis. Kidney failure occurs when the kidneys cannot properly remove wastes, which in turn causes the buildup of waste and fluid in the body. A physician can assess kidney failure through blood and urine tests. According to the National Kidney Foundation, 26 Million Americans have kidney disease and most do not know it. • Acute kidney failure develops suddenly, sometimes because of severe infection, drugs or other chemical agents, or physical trauma. If the underlying problem can be successfully treated, complete recovery of the kidneys is possible. • Chronic kidney failure develops gradually over years and may cause weight loss, anemia (low blood cell count), nausea or vomiting, tiredness, headaches, decreased mental sharpness, muscle twitches and cramps, yellowish-brown skin color, unusual itching, and trouble sleeping. • End-stage kidney disease causes anemia, high blood pressure, bone disease, heart failure, and poor mental functioning. Medline Plus (2012). "Kidney Failure". National Institutes of Health. Retrieved March 2014. National Kidney and Urologic Diseases Information Clearinghouse (2012). "The Kidneys and How They Work". National Institute of Diabetes and Digestive and Kidney Diseases. Retrieved March 2014. Khajehdehi, P. (2012). Turmeric: Reemerging of a neglected Asian traditional remedy. Journal of nephropathology, 1(1), 17. Crespy, V., &amp; Williamson, G. (2004). A review of the health effects of green tea catechins in in vivo animal models. The Journal of nutrition, 134(12), 3431S-3440S. Goyal, A., Sharma, V., Upadhyay, N., Gill, S., &amp; Sihag, M. (2014). Flax and flaxseed oil: an ancient medicine &amp; modern functional food. Journal of Food Science and Technology, 1-21. Rodriguez-Mateos, A., Heiss, C., Borges, G., &amp; Crozier, A. (2013). Berry (poly) phenols and cardiovascular health. Journal of agricultural and food chemistry. Nasri, H. (2013). Renoprotective effects of garlic. Journal of Renal Injury Prevention, 2(1). I was inspired to make more exciting vegan dishes so I started looking for simple but delicious ideas. I stumbled across this one idea to make vegan stuffed sweet potatoes. The process was fairly easy and it did not require many ingredients. I baked the sweet potatoes for about 30 minutes in the oven at 400 degrees with a drizzle of coconut oil, once they were half way cooked I cut them into flat wedges. I then made a simple guacamole ( avocado, sea salt, garlic, lemon juice). Once the wedges were soft and fully baked, I just layered them with the ingredients (black beans, corn, tomatoes, red onions, and topped it off with the guacamole). That was it! A simple vegan and gluten free dish! Inspired by this blog post. Water is the essence of life. Without water there is no life. Our bodies are mostly comprised of water. It is important for hydration, energy, digestion, and overall wellness to consume adequate water. It used to be that we had to consume 8 cups of water a day. We now know that this is an incorrect method. The best way to gauge how much you specifically need is based on your weight. Take your weight and divide it in half. That number is the base amount that you should consume. Example: 150 lbs = 75 oz. (9.5 cups) of water. If you are pregnant/ nursing, sick, in hot climate, and/or engage in physical activity you need to consume more water. When you get thirsty, go for the water before you go for the sugary drinks! We recently joined a community supported agriculture program (CSA) through Katchkie Farm located in Kinderhook, New York. The program "is a direct market relationship in which members pay for a season of produce before the season begins, making an investment in the farm" As a member we receive a weekly delivery of 6-11 different vegetables. I like this program because we get a nice variety of vegetables and as vegetarians we get exposed to new dish ideas that we normally would not have thought of or really considered. I find as a vegetarian that we often get tied to the same dishes and meals, this helps us to get out of our comfort zones and get super creative. We are also investing in our local farmers. So far it has been a pleasant experience!